Many people my age grew up with grandparents only a car (or sleigh) ride away. But the same proportion of us then raised our families far away from grandparents and cousins. Can we be surprised that we find ourselves with children now at opposite corners of the country or beyond? In these far-flung cases celebrating holidays with family presents more challenging decisions and weighing of options. But because it is so unusual for these families, a shared family holiday offers wonderful experiences and charming memories. If you want to lay the groundwork now for a family get together some time in the future, I suggest you sort out questions like these. Where will you gather? Putting a gathering at one family’s home (or on their turf) gives them the comforts of home, but it also implies responsibility for meals, accommodations, entertainment, and so on. Meeting at a place which is home to no one makes the gathering more neutral – but strange for all. Will the travel required be a fair distribution? When will you gather? Holidays carry emotional significance for everyone which can skew the implications of how much time you spend with each other. Are the in-laws “on board” with the plan or would they reserve some time to see their own families of origin during this time? Would the gathering be the same (or better, or worse) if you moved the plan to a time less “loaded” with emotional echoes? Is snow required for Christmas? Is sand a reasonable substitute? see how Disney does Christmas? 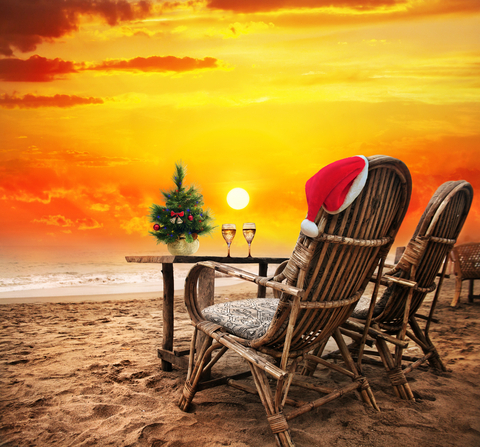 Do you just want to confuse people by celebrating Christmas on a beach somewhere? Are you just looking for a chance to spend time together? Can more than one objective be met with one trip? Who will gather? And who will pay for the trip? Should each family cover their own costs or can the ancestors foot the bill for all? I have read enough advice columns – and planned enough extended family trips — to know that these questions need to be addressed early and frankly among the stakeholders. Whether the plan is for a December weekend in New York, a week skiing in Colorado, or a Christmas cruise in the South Pacific, people need to have a chance to agree, decline, or suggest modifications without fear that they will be shut out of the plan or the family. A family vacation at holiday time can be a treasure to remember fondly for decades. With imagination and planning you can make this possible for the ones you love. Let me know how I can help! This entry was posted in Travel, Uncategorized and tagged beach, Christmas, extended family, family, grandparents, holiday, skiing, travel. Bookmark the permalink.